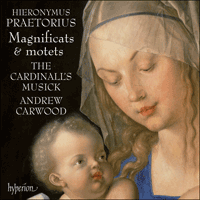 Hyperion is delighted to present a new disc from The Cardinall’s Musick under their inspirational director, Andrew Carwood. The music of Hieronymus Praetorius is as assured, expressive and original as the Dürer image which adorns the CD cover. Yet this fine composer is much less well-known than his namesake (but not relation) Michael Praetorius. Hieronymus Praetorius was organist of the Jacobikirche in Hamburg from 1586 until the end of his life. This somewhat sheltered background belies the sophisticated range of his works which are written in a variety of forms including the jubilant Venetian polychoral style. The composer’s highly individual voice, direct and yearning yet with a madrigalian lightness, pervades throughout. Praetorius’s works were published in a number of editions during his lifetime. A collected edition of the sacred music of Hieronymus Praetorius was issued between the years of 1616 and 1625; this collection included hitherto unpublished music as well as reissues of already available works. The 1622 volume presents the most daring versions of many of the pieces recorded here and contains Praetorius’s second (and previously unpublished) Magnificat quinti toni (‘in the fifth tone’) to which are attached polyphonic arrangements of the popular medieval tunes Joseph, lieber Joseph mein and In dulci iubilo. This later setting of the fifth-tone Magnificat is Praetorius’s masterpiece. The Cardinall’s Musick gives an impeccable yet delightfully extroverted performance of these fascinating works. Hieronymus (Jerome, Geronimo) Praetorius was born in 1560 in Hamburg where his father Jacob was organist at the Jacobikirche and the associated chapel of St Gertrud. When he was in his early twenties his father died and Hieronymus became organist, holding the post for the rest of his life. Between them, Praetorius father and son worked at the Jacobikirche in Hamburg for an uninterrupted period of seventy-five years. Only one composition by Praetorius senior survives (an unremarkable four-voice setting of the Te Deum). However, in the years immediately preceding and following Hieronymus’s birth, Jacob copied and compiled two large collections of German and Dutch church music. In addition to his teenage organ studies in Hamburg and Cologne, Hieronymus learnt the art and craft of music from studying the corpus of sacred music assembled by his father. Hieronymus in turn fathered four children, three of whom (Jacob, Michael, and Johannes) became church musicians. This Michael Praetorius (third son of Hieronymus) is not to be confused with the celebrated and prolific composer Michael Praetorius who, as it happens, did meet Hieronymus Praetorius in Gröningen in 1596; but other than that there is no connection between these two exceptional near contemporaries who happen to share the same surname. Gaudete omnes is an optimistic motet whose forward momentum is created by a fluent mixture of contrasting compositional styles. Closely woven six-voice imitative polyphony and agile madrigalian voice-exchange is balanced by solid homophonic writing, each section deftly linked to the previous one with the musical affect carefully chosen to suit the meaning of each phrase of the text. Throughout the motet, much of the listener’s attention is focused on the two upper voices which compete with each other during the imitative passages but sit comfortably together during the chordal sections. Praetorius shows such self-confidence in his mode of expression and in the clarity of word-setting that the contrapuntal mastery is easy to miss, not least in the Alleluia where the highest voice delivers an aurally arresting four-note statement which is the motif of the moment heard in inversion and augmentation. In contrast to the restless drive of Gaudete omnes, the six voices of O bone Jesu are combined in an indulgent texture that reflects the self-analysis of the opening words. Praetorius sustains a narrative which incorporates aggressive rhythms to depict self-blame (at ‘quod per culpam’), gently lilting, arching lines to portray nostalgic reminiscence (at ‘Memento’), and a bitter twist to what is ostensibly sweet harmony (at the first appearance of ‘dulcissime’). The desolation of Holy Week is convincingly painted in O vos omnes, although the opening is deliberately understated so that the sorrowful harmonies of the second half of the motet can appear to dominate. The Passiontide motet Videns Dominus is cast in a different mould altogether—eight voices are arranged in two equal choirs of four voices. Praetorius clearly enjoyed working in the polychoral medium (or strictly speaking bichoral in this case) which took recent developments from Venice as its starting point. The essence of this motet is disarmingly simple—the two choirs separately imitate or otherwise support each other until particularly important phrases within the text when both choirs join together (as, for instance, to great effect at Jesus’s calling of the name Lazarus). The eight Magnificats of Praetorius’s 1602 publication are represented here by those in the second and fourth modes (hypodorian and hypophrygian respectively). Their structures are formulaic, yet Praetorius displays an impressive ability to build innovative musical architecture using the strict scaffolding of the period. The even-numbered verses of the canticles are set polyphonically and bichorally in duple time while the odd-numbered verses are sung to the unadorned plainchant of the relevant mode. The polyphonic verses take the notes of the chant as their starting point, and each verse is carried away with a flight of fancy based as much on the speech-rhythm of the words as on their meaning. Both Glorias are set entirely polyphonically, the fourth-tone Magnificat alternating between triple and duple time and the second-tone Magnificat reserving its muscular triple-time section for the closing words ‘et in saecula saeculorum. Amen’. Like the Magnificat settings, A solis ortus cardine / Beatus auctor saeculi alternates plainchant with polyphony, although in this case the polyphonic verses are based much more closely on the notes of the plainchant hymn than are the polyphonic verses of the Magnificats. The technique of using a plainchant melody stretched out in long notes in one of the lowest voice parts was part of a compositional tradition stretching back for hundreds of years. Praetorius uses the technique (albeit not entirely strictly) to lend an antique feel to this motet’s varied textures. Oratio Dominica (a setting of The Lord’s Prayer for eight voices alternating with plainchant) elongates the notes of the plainchant in the second voice down in the polyphonic texture. Praetorius thereby achieves a grand and static effect in this highly polished miniature. Benedictio mensae and Laudate Dominum are settings of Psalm texts which show each side of the early-seventeenth-century musical coin respectively. Laudate Dominum is a predominantly Renaissance-influenced work where the seven-voice writing is infused with imitative and quasi-imitative polyphony. The motet possesses a grandeur that is achieved by underpinning the vigorous polyphony with gently old-fashioned dissonances whose function is to create a large acoustical effect from within the ensemble rather than relying upon the architecture of a large performance space to create a similar effect. By contrast, Benedictio mensae is a predominantly homophonic motet whose two choirs deliver the text (separately and in combination) with a clarity derived from a respect for natural word stress that was the ideal of the new Baroque practice. Joseph, lieber Joseph mein and In dulci iubilo are two of the best known of all ecclesiastical medieval tunes (the melody of Joseph, lieber Joseph mein is also frequently sung to the Latin text ‘Resonet in laudibus’). Both are Christmas carols, both are in compound duple time, and both are macaronic in that they use a mixture of German and Latin words. Praetorius sets both pieces for eight voices, but whereas In dulci iubilo is scored for a single eight-voice choir, Joseph, lieber Joseph mein is written for two contrasting four-voice choirs (one comprising the four highest voices and the other the four lowest voices). In Germany, Joseph, lieber Joseph mein was associated with the cradle-rocking ceremony at Christmas Vespers—a priest would sit next to a cradle containing an effigy of the baby Jesus and would rock the cradle gently in time to the lilting rhythm of the music. Praetorius sets this text with enormous sensitivity, thoroughly in keeping with the carol’s liturgical function. The high point occurs where the top voice soars to the upper limit of its range with the clearly audible line ‘Hodie apparuit’ (‘Today has appeared’) in a majestic statement of the Christmas miracle. In dulci iubilo is more athletic in its presentation of the text. Syncopations and well-directed suspensions propel the music forward, while at the end of the sixth line of each verse one of the high voices is left singing on its own in what is clearly the act of an organist sharing a Christmas joke with his singers. Ebullient and fervent at the same time, In dulci iubilo fits perfectly within the monumental Magnificat quinti toni where the carol’s syncopated opening matches the canticle’s syncopation at the words ‘et sanctum nomen eius’ which occur immediately before the carol’s first appearance within the Magnificat. The Magnificat—like both carols—is set for eight voices, although its bichoral disposition is subtly different to that of Joseph, lieber Joseph mein. Word-painting is at a premium in the fifth-tone Magnificat. The music rejoices, is holy, is powerful, scatters, and sends empty away as the text requires. Most notably, Abraham is afforded unique respect through the use of resonant block chords which have the effect of freezing time and allowing the listener to connect directly with the Old Testament. The Gloria is symphonic, in the best sense of the word, with all the voices sounding together to create a climax of quite extraordinary power and finality. Hieronymus (Jérôme, Geronimo) Praetorius naquit en 1560 à Hambourg, où son père Jacob était organiste à la Jacobikirche et à la chapelle Sainte-Gertrude qui y était associée. Son père mort, il devint à son tour, à vingt ans un peu passés et pour le restant de ses jours, organiste de la Jacobikirche—à eux deux, les Praetorius tinrent donc pendant soixante-quinze ans d’affilée la tribune de cette église hambourgeoise. De Praetorius père, seul un banal Te Deum à quatre voix nous a été conservé. Mais quelques années avant et après la naissance de Hieronymus, il copia et compila deux vastes recueils de musique liturgique allemande et hollandaise. Après avoir étudié l’orgue, quand il était adolescent, à Hambourg et à Cologne, Hieronymus apprit tout l’art musical grâce à ce corpus colligé par son père. Puis il eut lui-même quatre enfants, dont trois (Jacob, Johannes et Michael) devinrent musiciens d’église. Il ne faut toutefois pas confondre Michael, le troisième fils de Hieronymus, avec le célèbre et prolifique compositeur Michael Praetorius—deux hommes d’exception, quasi contemporains, que seule reliait leur homonymie. Publié à Hambourg en 1599, le premier recueil musical de Hieronymus Praetorius réunissait des pages inédites comme Gaudete omnes, O bone Jesu, O vos omnes et Videns Dominus. Trois ans plus tard, le compositeur fit paraître huit Magnificat, un dans chacun des huit tons. D’autres partitions liturgiques furent éditées en 1607, notamment Beatus auctor saeculi et l’Oratio Dominica. Entre 1616 et 1625, une édition (presque) complète de la musique sacrée de Hieronymus Praetorius sortit en cinq volumes, avec des pièces encore inédites (ainsi les Benedictio mensae et Laudate Dominum parus en 1618) et des rééditions. Outre les versions les plus audacieuses de plusieurs œuvres enregistrées ici, le volume de 1622 contient le second Magnificat quinti toni, alors publié pour la première fois. Ce Magnificat «dans le cinquième ton» tardif, auquel sont rattachés des arrangements polyphoniques des airs populaires médiévaux Joseph, lieber Joseph mein et In dulci iubilo, est le chef-d’œuvre de Praetorius. Gaudete omnes est un motet optimiste qui va de l’avant grâce à un fluide mélange de styles contrastants: une polyphonie à six voix en imitation serrée et d’agiles échanges vocaux madrigalesques y sont balancés par une robuste écriture homophone, chaque section étant habilement reliée à la précédente par un effet musical choisi avec soin en fonction du sens de chaque phrase textuelle. Tout au long du motet, l’attention de l’auditeur est essentiellement focalisée sur les deux voix supérieures qui rivalisent entre elles durant les passages imitatifs, mais qui s’asseoient confortablement pendant les sections en accords. Praetorius affiche une telle assurance dans son mode d’expression, dans la clarté de sa mise en musique, que l’on pourrait aisément passer à côté de sa maestria contrapuntique, surtout dans l’Alleluia, où la voix la plus aiguë délivre une énonciation de quatre notes, saisissante sur le plan sonore, qui est le motif du moment entendu en renversement et en augmentation. Par contraste avec l’allant nerveux de Gaudete omnes, les six voix de O bone Jesu sont combinées en une texture conciliante, reflet de l’autoanalyse des premiers mots. Praetorius maintient une narration qui incorpore des rythmes agressifs (pour dépeindre le mea-culpa, à «quod per culpam»), des lignes en arche doucement allantes (pour traduire la réminiscence nostalgique, à «Memento») et une amère torsion faite à ce qui est une harmonie en apparence paisible (au premier «dulcissime»). La désolation de la Semaine sainte est brossée de manière convaincante dans O vos omnes, même si l’ouverture est délibérément discrète pour que les harmonies affligées de la seconde moitié du motet puissent sembler dominer. Le motet pour le temps de la Passion Videns Dominus est coulé dans un tout autre moule: huit voix sont agencées en deux chœurs égaux de quatre voix. À l’évidence, Praetorius apprécia de travailler cette polychoralité (ou, à strictement parler ici, cette bichoralité) qui, partie de Venise, connaissait alors un développement récent. L’essence de ce motet est d’une simplicité désarmante: les deux chœurs s’imitent séparément ou se soutiennent mutuellement pour se réunir aux mots les plus importants (ainsi, par exemple, avec beaucoup d’effet, à la mention du nom de Lazare). Les huit Magnificat publiés en 1602 sont représentés ici par ceux dans les deuxième et quatrième tons (respectivement hypodorien et hypophrygien). Leurs structures sont à base de formules, mais Praetorius montre une impressionnante capacité à bâtir une architecture musicale novatrice avec le strict échafaudage de l’époque. Les versets pairs des cantiques sont traités en mètre binaire de manière polyphonique et bichorale, les impairs étant, eux, exécutés sur le plain-chant dépouillé du mode adéquat. Les versets polyphoniques prennent pour point de départ les notes du plain-chant et chaque verset est emporté par une envolée imaginative fondée sur le rythme de la parole autant que sur le sens des mots. Les deux Gloria sont entièrement polyphoniques, le Magnificat dans le quatrième ton alternant entre mètre binaire et ternaire, tandis que celui dans le deuxième ton réserve sa vigoureuse section ternaire à l’«et in saecula saeculorum. Amen» conclusif. Comme les Magnificat, A solis ortus cardine / Beatus auctor saeculi est marqué par une alternance de plain-chant et de polyphonie, même si, ici, les versets polyphoniques s’appuient beaucoup plus sur les notes de l’hymne grégorienne. Utiliser, à l’une des parties les plus graves, une mélodie de plain-chant étirée en valeurs longues ressortissait à une tradition séculaire. Praetorius recourt à cette technique (quoique de manière pas tout à fait stricte) pour donner un côté vieillot aux textures variées de son motet. Oratio Dominica (une mise en musique du Notre-Père à huit voix alternant avec le plain-chant) allonge les notes du plain-chant à la deuxième voix grave de la texture polyphonique, ce qui permet à Praetorius d’obtenir un effet grandiose et statique dans cette miniature raffinée à souhait. Benedictio mensae et Laudate Dominum, sur des textes psalmiques, montrent chancun une face de la médaille musicale du début du XVIIe siècle. Laudate Dominum est un motet d’influence essentiellement renaissante, où l’écriture à sept voix est impregnée de polyphonie imitative et quasi imitative. Il tire son grandiose de ce que cette vigoureuse polyphonie est étayée par des dissonances délicatement surannées, chargées de produire un vaste effet acoustique venant de l’intérieur, sans avoir à compter sur l’achitecture d’un grand espace d’exécution. Par contraste, Benedictio mensae est un motet à prédominance homophone dont les deux chœurs délivrent le texte (séparément ou en combinaison) avec une clarté née du respect de l’accent naturel des mots, idéal de la nouvelle pratique baroque. Joseph, lieber Joseph mein et In dulci iubilo sont parmi les plus célèbres airs ecclésiastiques médiévaux (la mélodie de Joseph, lieber Joseph mein est également appliquée au texte latin «Resonet in laudibus»). Ce sont des chants de Noël, écrits en mesure composée binaire et macaroniques, c’est-à-dire utilisant un mélange de mots allemands et latins. Pour chacun, Praetorius a conçu une musique à huit voix: regroupées en un seul chœur dans In dulci iubilo, elles sont réparties en deux chœurs contrastifs (réunissant l’un les quatre voix aiguës, l’autre les quatre graves) dans Joseph, lieber Joseph mein. En Allemagne, ce dernier chant était associé à la cérémonie du bercement, aux vêpres de Noël—un prêtre s’asseyait près d’un berceau contenant une effigie de l’enfant Jésus et le berçait doucement au rythme entraînant de la musique. Le traitement musical, immensément sensible, de Praetorius est en intime phase avec la fonction liturgique de ce chant de Noël. Le summum est atteint lorsque la voix supérieure s’élève jusqu’à l’extrême limite de son étendue, avec la ligne «Hodie apparuit» («aujourd’hui, il apparut») bien audible, en une énonciation majestueusement limpide du miracle de Noël. In dulci iubilo présente son texte avec davantage de vigueur. Des syncopes et des suspensions bien menées projettent la musique vers l’avant, tandis qu’à la fin de la sixième ligne de chaque strophe, une des voix aiguës se retrouve à chanter seule—c’est là, à l’évidence, le geste d’un organiste partageant une blague de Noël avec ses choristes. Exubérant et fervent à la fois, In dulci iubilo s’imbrique à merveille dans le monumental Magnificat quinti toni, lorsque son ouverture syncopée égale la syncope du cantique à «et sanctum nomen eius», juste avant sa première apparition. Comme les deux chants de Noël, ce Magnificat dans le cinquième ton est à huit voix, mais son agencement bichoral diffère subtilement de celui de Joseph, lieber Joseph mein. Les figuralismes y prédominent: la musique se réjouit, est sainte, est puissante, s’éparpille et se vide quand le texte l’exige. Chose remarquable entre toutes, Abraham se voit accorder un égard unique par le biais de blocs d’accords retentissants qui gèlent le temps et permettent à l’auditeur d’entrer en connexion directe avec l’Ancien Testament. Le Gloria est symphonique au meilleur sens du terme: toutes les voix résonnent ensemble pour créer un climax d’une force et d’une irrévocabilité absolument extraordinaires. Hieronymus (Jerome, Geronimo) Praetorius wurde 1560 in Hamburg geboren, wo sein Vater Jacob Organist an der Jacobikirche und der assoziierten St. Gertrudskapelle war. Anfang seiner 20er Jahre wurde Hieronymus nach dem Tode seines Vaters Organist und hielt diesen Posten bis zum Ende seines Lebens. Insgesamt arbeiteten Vater und Sohn Praetorius 75 Jahre lang ununterbrochen an der Jacobikirche in Hamburg. Nur eine Komposition von Praetorius Senior ist erhalten (ein belangloses vierstimmiges Te Deum). In den Jahren kurz vor und nach der Geburt von Hieronymus kopierte und sammelte Jacob zwei umfangreiche Sammlungen von deutscher und niederländischer Kirchenmusik. Zusätzlich zu seinem Orgelstudium in Hamburg und Köln in seinen Jugendjahren lernte Hieronymus sein Handwerk durch das Studium des von seinem Vater zusammengestellten Korpus’ von Kirchenmusik. Hieronymus selbst zeugte vier Kinder, von denen drei (Jacob, Michael und Johannes) Kirchenmusiker wurden. Diesen Michael Praetorius (dritten Sohn von Hieronymus) darf man jedoch nicht mit dem berühmten und fruchtbaren Komponisten Michael Praetorius verwechseln, der übrigens 1596 Hieronymus Praetorius in Gröningen traf. Sonst gibt es aber zwischen diesen beiden außergewöhnlichen nahen Zeitgenossen, die sich zufällig den gleichen Nachnahmen teilen, keine weitere Verbindung. Die erste veröffentlichte Sammlung von Musik von Hieronymus Praetorius wurde 1599 in Hamburg gedruckt. Gaudete omnes, O bone Jesu, O vos omnes und Videns Dominus erschienen alle zuerst in dieser Sammlung. Drei Jahre später veröffentlichte Praetorius acht Vertonungen des Magnificat, jeweils eine in den acht Kirchentönen. 1607 folgte die Publikation von mehr Kirchenmusik von Praetorius, einschließlich Beatus auctor saeculi und der Oratio Dominica. Zwischen 1616 und 1625 erschien eine Sammelausgabe der geistlichen Musik von Praetorius in fünf Bänden; diese (nahezu) Gesamtausgabe enthielt Musik, die bisher unveröffentlicht war (wie etwa die Ausgabe der Benedictio mensae und des Laudate Dominum von 1618) sowie die wiederveröffentlichung bereits verfügbarer Werke. Der Band von 1622 präsentiert die gewagtesten Fassungen vieler der hier aufgenommenen Werke, und enthält Praetorius’ zweites (und zuvor nicht veröffentlichtes) Magnificat quinti toni („im fünften Ton“) dem polyphone Bearbeitungen beliebter Weisen aus dem Mittelalter angehängt sind: Joseph, lieber Joseph mein und In dulci iubilo. Diese späte Vertonung des Magnificat im fünften Ton ist Praetorius’ Meisterstück. Gaudete omnes ist eine optimistische Motette, deren Elan durch eine fließende Mischung kontrastierender Kompositionsstile kreiert wird. Eng verwebte sechsstimmige imitative Polyphonie und reger madrigalistischer Austausch zwischen den Stimmen wird durch solide homophone Passagen ausbalanciert, und jeder Abschnitt wird geschickt mit dem vorangegangenen verknüpft, wobei der musikalische Effekt jeweils sorgfältig auf die Bedeutung der einzelnen Phrasen des Texts angepasst wird. Die ganze Motette hindurch wird die Aufmerksamkeit des Hörers auf die beiden Oberstimmen konzentriert, die während der imitativen Passagen miteinander konkurrieren, aber in den homophonen Abschnitten harmonisch zusammenarbeiten. Praetorius zeigt in seiner Ausdrucksweise und Klarheit der Wortvertonung solches Selbstbewusstsein, dass die kontrapunktische Meisterschaft, nicht zuletzt im Alleluja, leicht zu übersehen ist, wo die höchste Stimme ein viernotiges Motiv präsentiert, das aufhören lässt und augenblicklich in Umkehrung und Augmentation zu hören ist. Im Kontrast zur rastlosen Energie von Gaudete omnes werden die sechs Stimmen von O bone Jesu in einer schwelgerischen Strukturkombiniert, die die Selbstanalyse der Anfangsworte reflektiert. Praetorius spinnt einen Erzählungsfaden, der aggressive Rhythmen einbaut, um Selbstbeschuldigung (bei „quod per culpam“) auszudrücken, sanft gesponnene Bögen, um (bei „Memento“) nostalgische Erinnerung zu schildern, und einen bitteren Beigeschmack zu einer scheinbar süßen Harmonie (beim ersten „dulcissime“). In O vos omnes wird die Trostlosigkeit der Karwoche überzeugend gezeichnet, obwohl der Anfang bewusst dezent gehalten ist, damit die kummervollen Harmonien der zweiten Hälfte der Motette dominieren können. Die Fastenmotette Videns Dominus is in eine ganz andere Form gegossen—acht Stimmen werden in zwei gleiche vierstimmige Chöre arrangiert. Praetorius genoss offensichtlich, im mehrchörigen (oder in diesem Falle streng genommen doppelchörigen) Medium zu arbeiten, das die jüngsten Entwicklungen in Venedig zum Vorbild hat. Das Wesen dieser Motette ist entwaffnend schlicht—die beiden Chöre imitieren jeweils separat oder unterstützen sich gegenseitig, bis sich beide Chöre in besonders bedeutenden Phrasen vereinen (wie zum Beispiel besonders wirkungsvoll, als Lazarus erwähnt wird). Die acht Magnificats aus Praetorius’ Veröffentlichung von 1602 werden hier durch die im zweiten und vierten Modus (hypo-dorisch und hypo-phrygisch) repräsentiert. Ihre Struktur ist jeweils formelhaft, aber Praetorius zeigt ein beeindruckendes Talent für innovative musikalische Architektur innerhalb des strengen Gerüsts der Periode. Die geradzahligen Verse der Lobgesänge sind polyphon und doppelchörig im Zweier-Metrum gesetzt, die ungeradzahligen ungeschmückt choraliter im entsprechenden Kirchenton. Die polyphonen Verse nehmen die Töne des Chorals als Ausgangspunkt, und jeder Vers wird in einem Phantasieflug davongetragen, der genauso auf dem Sprechrhythmus der Worte als auf ihrer Bedeutung basiert. Beide Glorias sind vollständig polyphon vertont; das Magnificat im vierten Ton alterniert zwischen Zweier- und Dreiermetrum, während das im zweiten Ton sein viriles Dreiermetrum für die Schlussworte „et in saecula saeculorum. Amen“ aufhebt. Wie die Magnificat-Vertonungen alterniert auch A solis ortus cardine / Beatus auctor saeculi zwischen Choral und Polyphonie, obwohl die polyphonen Verse sich in diesem Fall näher an die Choralmelodie halten als die der Magnificats. Die Technik, eine Choralmelodie in langen Notenwerten als eine der tiefsten Stimmen zu verwenden, gehört zu einer Jahrhunderte alten Kompositionstradition. Praetorius nutzt diese Technik (wenn auch nicht ganz strikt), um dieser abwechslungsreichen Motette ein antikes Flair zu verleihen. Oratio Dominica (eine Vertonung des Vaterunsers für acht Stimmen, im Wechselgesang mit Choral) verlängert die Noten des Chorals in der zweiten Oberstimme im polyphonen Satz. Dadurch erreicht Praetorius in dieser fein geschliffenen Miniatur einen grandiosen, statischen Effekt. Benedictio mensae und Laudate Dominum sind Vertonungen von Psalmtexten, die beide Seiten der musikalischen Münze des frühen 17. Jahrhunderts zeigen—Laudate Dominum ist vorwiegend von der Renaissance beeinflusst, und der siebenstimmige Satz ist von imitativer und quasi imitativer Polyphonie erfüllt. Die Motette besitzt eine Erhabenheit, die erreicht wird, indem die lebhafte Polyphonie durch sanft-altmodische Dissonanzen unterstützt wird, die erreichen soll, aus dem Ensemble heraus eine großräumige Wirkung zu erreichen, statt sich auf die Architektur eines großen Raums für die Aufführung verlassen zu müssen. Im Gegensatz dazu ist Benedictio mensae eine vorwiegend homophone Motette, deren zwei Chöre den Text (separat und vereint) mit einer Klarheit vermitteln, die aus dem Respekt vor natürlicher Wortbetonung geboren ist, die das Ideal der neuen Barockpraxis war. Joseph, lieber Joseph mein und In dulci iubilo sind zwei der wohlbekanntesten aller mittelalterlichen Kirchenlieder (die Melodie für Joseph, lieber Joseph mein wird auch oft auf den lateinischen Text „Resonet in laudibus“ gesungen). Beide sind Weihnachtslieder, beide in zusammengesetzten Metren und beide makkaronisch, indem sie eine Mischung von deutschen und lateinischen Worten verwenden. Praetorius vertont beide Stücke achtstimmig, aber In dulci iubilo ist für einen achtstimmigen Chor gesetzt und Joseph, lieber Joseph mein für zwei kontrastierende vierstimmige Chöre (einer mit den vier höchsten, der andere mit den vier tiefsten Stimmen). In Deutschland war Joseph, lieber Joseph mein mit dem Wippen der Krippe in der Weihnachtsvesper assoziiert—ein Priester saß bei einer Krippe mit einer Statue des Christkindes und schaukelte die Krippe im wiegenden Rhythmus der Musik. Praetorius vertont diesen Text mit großer Feinfühligkeit und ganz der liturgischen Funktion des Liedes angemessen. Der Höhepunkt ist, wenn die höchste Stimme auf die deutlich hörbaren Worte „Hodie apparuit“ („Heute erscheint er“) sich in einer majestätisch hörbaren Vermittlung des Weihnachtswunders in ihr höchstes Register aufschwingt. In dulci iubilo präsentiert den Text athletischer. Synkopierungen und wohl platzierte Vorhalte treiben die Musik voran, während am Ende der sechsten Zeile jeder Strophe eine der höchsten Stimmen alleine weitersingt—offensichtlich teilt sich der Organist hier einen Weihnachtswitz mit seinen Sängern. Gleichzeitig überschwänglich und glühend passt In dulci iubilo wunderbar zum monumentalen Magnificat quinti toni, wo der synkopierte Anfang des Weihachtsliedes der Synkopierung des Lobgesangs bei den Worten „et sanctum nomen eius“ unmittelbar vor dem ersten Erscheinen des Liedes im Magnificat entspricht. Das Magnificat ist genauso wie die beiden Lieder für acht Stimmen gesetzt, obwohl seine doppelchörige Anordnung sich leicht von der in Joseph, lieber Joseph mein unterscheidet. Wortmalerei findet sich in Überfülle im Magnificat im fünften Ton. Die Musik frohlockt, ist heilig, ist kraftvoll, zersprengt und schickt leer weg, wie es der Text verlangt. Besonders Abraham wird durch die Verwendung resonanter Blockakkorde einzigartiger Respekt gezollt, die die Zeit stillstehen lassen und den Hörer direkt mit dem Alten Testament verbindet. Das Gloria ist im besten Sinne des Wortes symphonisch, indem alle Stimmen zusammen erklingen und in einer Steigerung von außerordentlicher Kraft und Finalität kulminieren.